This tutorial is intended for people who want to develop a fully custom Qt-based viewer for glue that does not use Matplotlib and does not use the state class infrastructure. If you don’t already have an existing widget, but want to make sure it will work outside glue, start off by developing the widget outside of glue, then use the instructions below to make it usable inside glue. 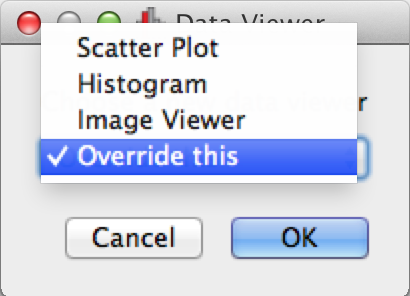 LABEL = "My first data viewer"
However, this will simply plot the initial data and plot more data if you drag datasets onto the window, but you will not for example be able to remove datasets, show subsets, and so on. In some cases, that may be fine, and you can stop at this point, but in other cases, if you want to define a way to interact with subsets, propagate selections, and so on, you will need to listen for events, which is discussed in Listening for events. But first, let’s take a look at how we can add side panels in the dashboard which can include for example options for controlling the appearance or contents of your visualization. In the glue interface, under the data collection is an area we refer to as the dashboard, where different data viewers can include options for controlling the appearance or content of visualizations (this is the area indicated as C in :doc:getting-started). You can add any widget to the two available spaces. In your wrapper class, MyGlueWidget in the example above, you will need to define a method called options_widget, which returns an instantiated widget that should be included in the dashboard on the bottom left of the glue window, and can contain options to control the data viewer. Note that despite the name, you can actually use the options widget to what you want, and the important thing is that options_widget is the bottom left pane in the dashboard on the left. By default, any sub-class of ~glue.viewers.common.qt.data_viewer will also include a list of layers in the central panel in the dashboard. Layers can be thought of as specific components of visualizations - for example, in a scatter plot, the main dataset will be a layer, while each individual subset will have its own layer. The order of the layers (which controls which one appears in front of which) can then be set by dragging the layers around, and the color/style of the layers can also be set from this list of layers. Conceptually, layer artists can be used to carry out the actual drawing and include any logic about how to convert data into visualizations. If you are using Matplotlib for your visualization, there are a number of pre-existing layer artists in glue.viewers. *.layer_artist, but otherwise you will need to create your own classes. Essentially, each layer artist has to define the three methods shown above. The clear method should remove the layer from the visualization, the redraw method should redraw the entire visualization, and update, should update the appearance of the layer as necessary before redrawing. If the user removes a layer from the list of layers by e.g. hitting the backspace key, the clear method is called, followed by the redraw method. © Copyright 2012-2017, Chris Beaumont, Thomas Robitaille, Michelle Borkin. Revision 650a65d7.